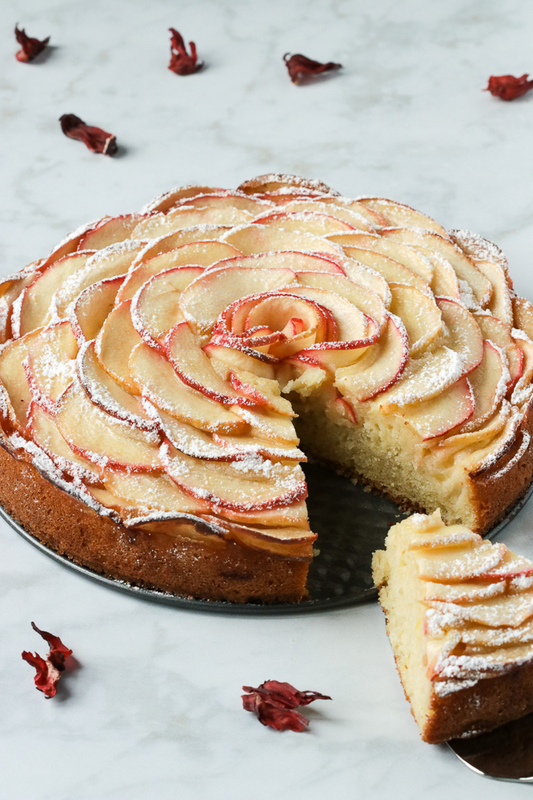 Wow your guests with this simple and impressive Apple Rose Cake made with SweeTango apples. It’s far easier to make then it actually looks and so eye popping gorgeous that you’ll almost wish you didn’t have to slice into it. Well…almost! This is not a sponsored post but rather a product we love and enjoy. 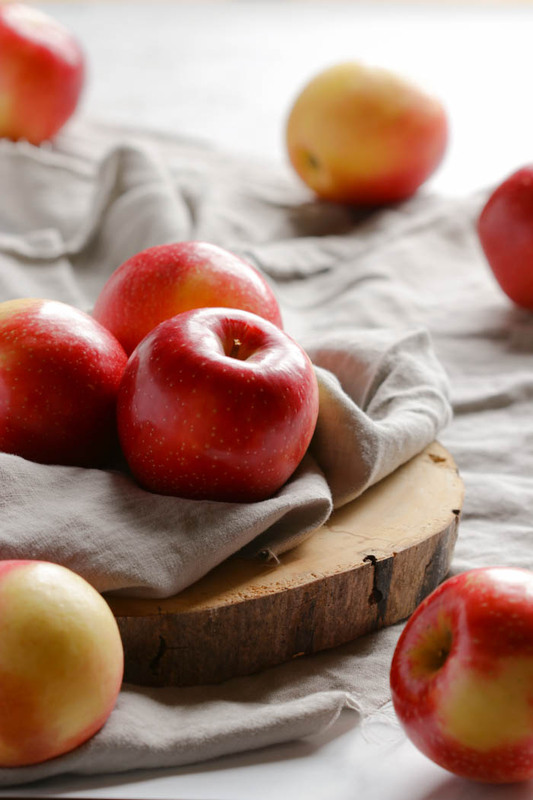 My husband just recently introduced me to the most incredibly sweet and crisp apple ever…the SweeTango apple! He came home one evening and diligently pulled out one single apple from his briefcase. A friend had given him the apple with very clear instructions that I was to be the taste tester of this remarkably delicious fruit. After one bite it was quite evident that the SweetTango apple was indeed the best apple we’ve ever tasted. I can truly say that we’ve been having our fair share of sweet tangos since! There is much to love about this tangy apple with its citrusy and honey taste. The star child of the Honeycrisp and Zestar apple, this SweeTango inherited its crimson red hue with yellowish tinge from both parents. And… among other delicious attributes! It’s crisp and snappy to the bite and also has the creamiest white flesh I’ve yet to see in any apple. 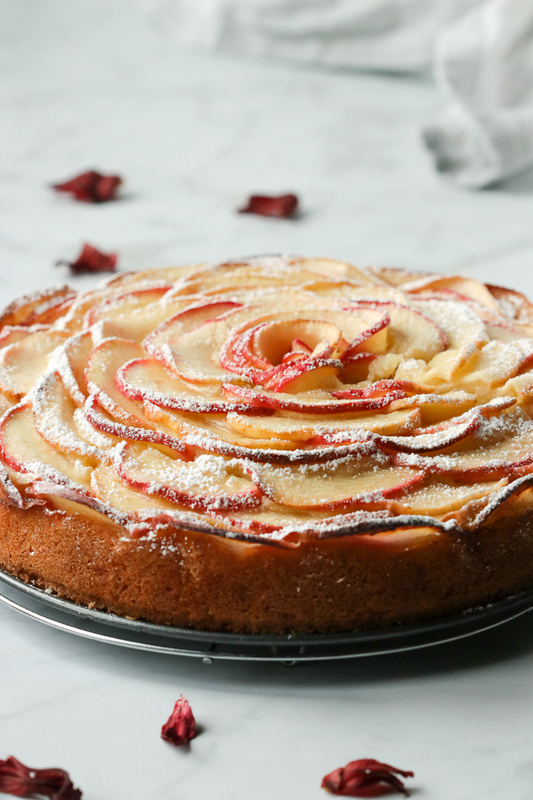 Can You Bake With SweeTango Apples? 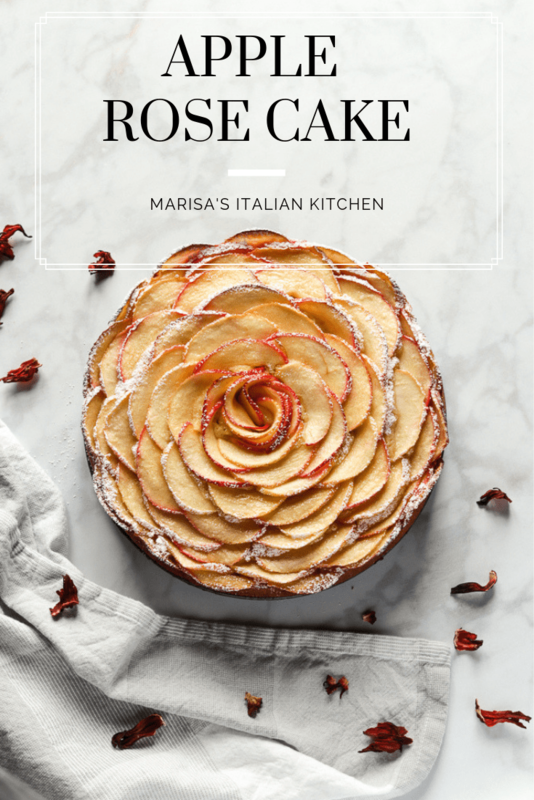 Coincidently, I was making my way to redoing an older recipe in my archives, this Rustic Italian Apple Cake. It totally needed a redo since the photos were not so flattering to the actual cake. And so, inspired by the creamy white flesh of the SweeTango apple I thought it would be wonderful to showcase the thin slices of apples by crowning them in a rosette fashion over the cake. This would also test the theory if they actually held up well to baking. So after a few miner tweaks to my original recipe, I must say it far surpassed my expectations. Except now it no longer looked rustic but rather quite elegant. With a little maple syrup gently brushed over the warm cake to give it a little sheen. Then a light dusting of powdered sugar just before serving and you’ve got one very eye popping gorgeous Apple Rose Cake. We start with thinly sliced apples, tossed in a large bowl with freshly squeezed lemon juice, melted butter and some brown sugar. The apple mixture is then heated in the microwave to render them soft and pliable. The lemon juice will keep the apples from browning and the slices will absorb the melted butter with sugar. This helps to keep the apples hydrated during the baking time. Start at the outer edge of the cake and place the apple slices upright while overlapping them and pressing them slightly into the batter. Finish one full round circle then on the second round start placing the apples in front of two joined slices. Continue overlapping the apple slices till you’ve reached the center. 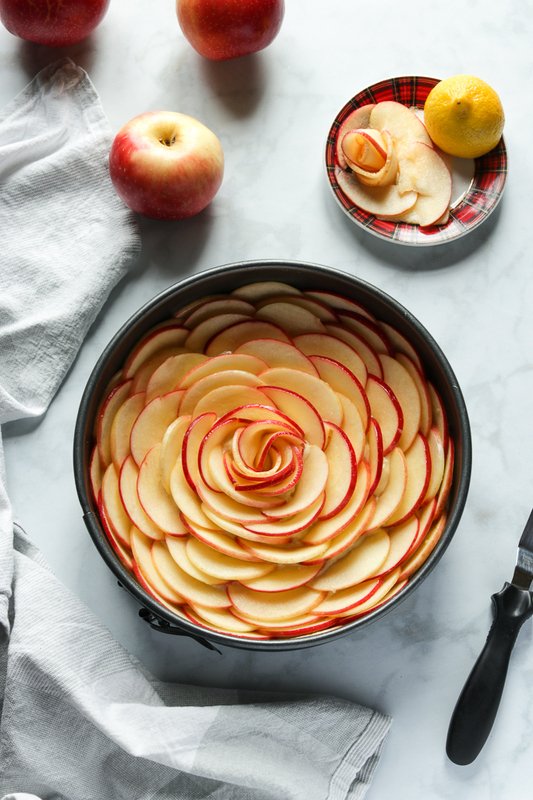 For one big center rose, you’ll want to line up 6 apple slices, one overlapping the other. Take one end and gently roll to the opposite end while keeping them tightly together. Place in the center of the cake and your done! Bake it for a special occasion or simply an anytime treat and enjoy with your favourite cup of coffee or tea! 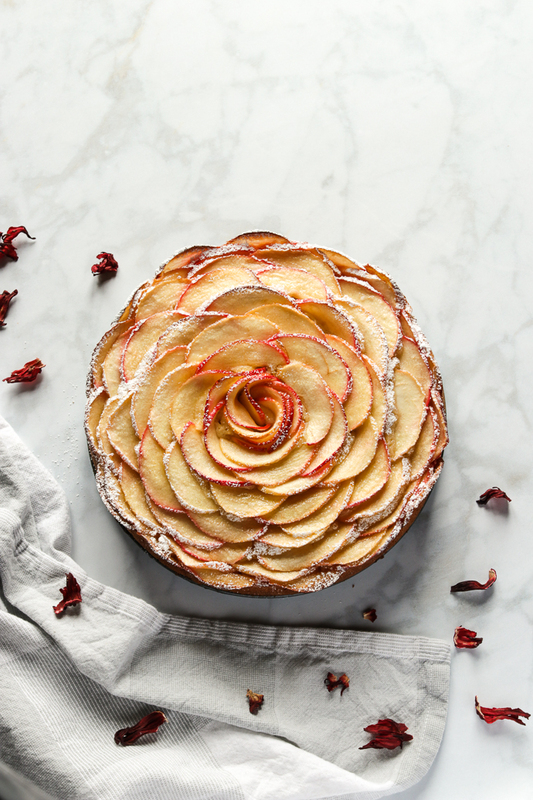 Wow your guest with this simple and impressive Apple Rose Cake made with SweeTango apples and topped with a mound of sliced apples shaped to form a rose. Slice the apples in half, remove the core and slice each half into very thin slices. About 1/8 inch thin. Toss together the sliced apples, lemon juice, melted butter and brown sugar in a medium sized microwave safe bowl. Zap in the microwave for 2 minutes, turning to toss again half way through and set aside while you prepare the cake. Grease a 9 inch springform pan and set aside. In a large bowl, beat together the softened butter and sugar until creamy for about 1 minute. Beat in the eggs one at a time until well combined. Stir in the vanilla extract and the lemon zest. In a separate medium sized bowl, whisk together the flour, baking powder and salt. With the mixer on low, add the flour mixture to the butter mixture, alternating with the almond milk while making 3 additions of dry and two of wet. Spoon the batter into the prepared pan and level the top with an offset spatula or the back of a spoon. 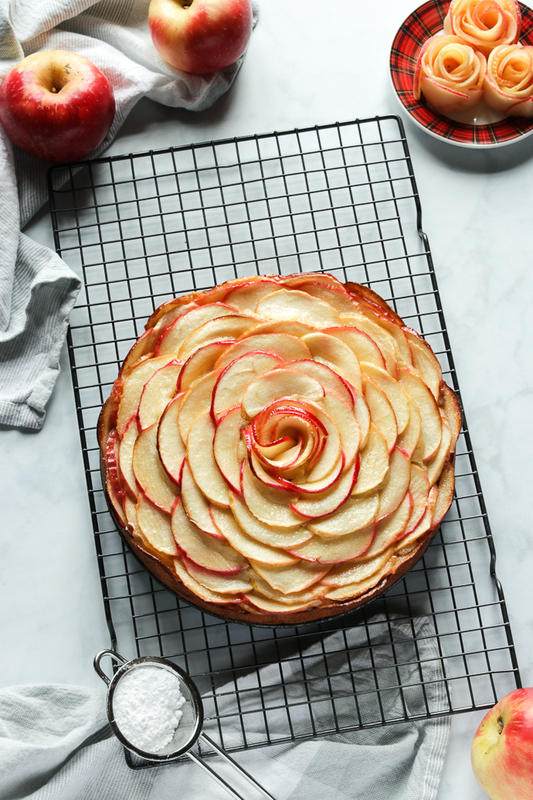 If you want to add an apple rosette in the middle leave a little space and do this...line 6 slices of apples lengthwise while overlapping them slightly and start rolling from one end to the opposite end while shaping a rose then place in the center top of the cake. Bake in a preheated oven for 40 minutes or until a cake inserted in the center comes out clean. While still warm gently brush the top of the cake with the warm maple syrup and allow to cool. This will give the apples a pretty sheen. Sweetango apples are available in Canada from about mid September to December. In Quebec they are exclusive to Metro and IGA grocery stores.